The hiking tours take you on trails, forest roads, country lanes, carriage roads, coastal paths, and forgotten byways in the Northeastern U.S., including the very popular self guided Vermont Inn to Inn tour; the mountains and hollows on the North Carolina Mountains tour; or lava fields and rainforests on the Hawaii big Island tour. Or you can experience the thrill of snowshoeing through pristine winter landscapes on the Vermont or Adirondacks snowshoe tour. Unforgettable experiences on our small (2 to 9 person), intimate owner-led custom outings. Rural villages, covered bridges, historic sites, beautiful woodlands, mountain scenery, pastoral valleys, clean flowing waters, pristine beaches, and panoramic overlooks through countryside you may never find on you own. Feel fresh country breezes, sample wild berries or apples in season, great local foods, and wine tasting! Savor all of this and more on one of our unforgettable hiking or snowshoe tours! All custom trips are rated easy-to-moderate, with challenging options, but can be upgraded for you to be more strenuous, depending on your preferences. We usually need at least 2 to 5 people to run a guided trip using our large network of inns. Reservations generally should be made at least three months in advance, but can sometimes can be arranged on shorter notice. For autumn foliage season in the Northeast (mid-September - throgh October), reservations for one of the hiking tours should be made at least 5 months ahead, if possible. Contact us now to join a scheduled a tour or tell us when you want to go, and we'll set up a custom tour especially for you and/or your group! A recent guest experience on the Vermont Inn-to-Inn trip: "Our trip to Vermont was so fine - one of the best vacations we've had in years! And we very much appreciate your expertise and work that made it possible and we know much of the work was behind the scenes and occurred weeks before we arrived. The days just flowed by effortlessly? and that's because the effort was yours! Time seemed to slow down and we felt as though we had been away a good long while. And we thank you for that." A quote of a guest from Washington State: "The trip was above our expectations. We didn't know exactly what to expect, but we all had a wonderful time. The walks where fun and never left us so tired that we didn't enjoy the evenings". 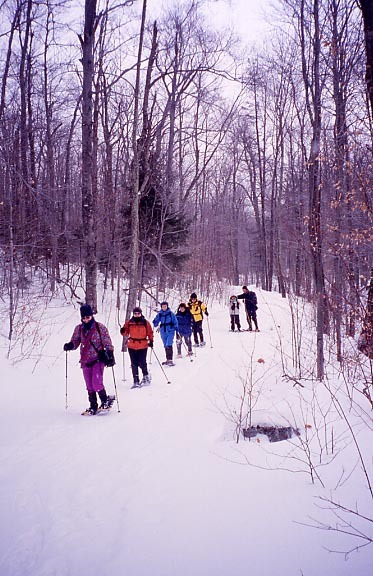 A recent quote from a guest from Washington, DC who was on our Vermont Snowshoe Trip: "Thanks for a terrific snowshoeing trip. The itinerary that you arranged was excellent; the snowshoe trails were beautiful, and the inn and food were great." Another from Pennsylvania: "It was fun! I hope to get up there (Vermont) again sometime. Thanks!" to even find the right trailhead. It is a really neat idea."